After a long dry spell, I finally logged a new station Saturday evening: WWDB on 860 kHz transmitting 10,000 watts from Philadelphia, 163 miles to the southwest. When I logged WWDB, "The Multicultural Voice of the Delaware Valley," was broadcasting someone singing The Beatles' Norwegian Wood in a language I did not recognize... something different and more enjoyable than the normal AM radio fare. Equipment used: ICOM IC-R8600 receiver and 80-meter dipole. The US astronaut who pioneered the use of Amateur Radio to make contacts from space - Owen K. Garriott, W5LFL - died April 15 at his home in Huntsville, Alabama. He was 88. Garriott's ham radio activity ushered in the formal establishment of Amateur Radio in space, first as SAREX - the Shuttle Amateur Radio Experiment, and later as ARISS - Amateur Radio on the International Space Station. "Owen Garriott was a good friend and an incredible astronaut," fellow astronaut Buzz Aldrin tweeted. "I have a great sadness as I learn of his passing today. Godspeed Owen." An Oklahoma native, Garriott - an electrical engineer - spent 2 months aboard the Skylab space station in 1973 and 10 days aboard Spacelab-1 during a 1983 Space Shuttle Columbia mission. It was during the latter mission that Garriott thrilled radio amateurs around the world by making the first contacts from space. 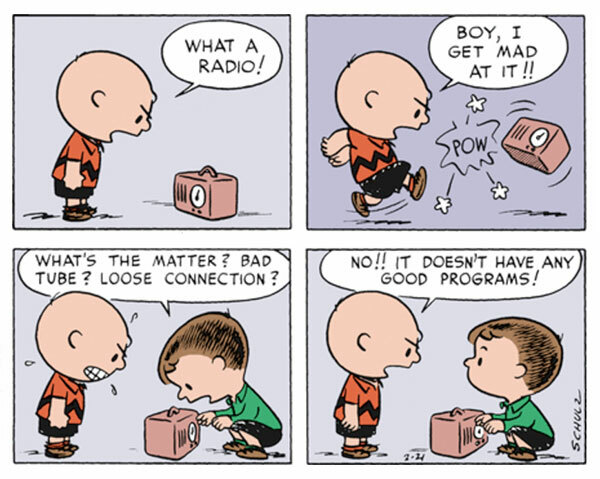 Thousands of hams listened on 2-meter FM, hoping to hear him or to make a contact. Garriott ended up working stations around the globe, among them such notables as the late King Hussein, JY1, of Jordan, and the late US Senator Barry Goldwater, K7UGA. He also made the first CW contact from space. Garriott called hamming from space "a pleasant pastime." "I managed to do it in my off-duty hours, and it was a pleasure to get involved in it and to talk with people who are as interested in space as the 100,000 hams on the ground seemed to be," he said in an interview published in the February 1984 edition of QST. "So, it was just a pleasant experience, the hamming in particular, all the way around." Although Garriott had planned to operate on ham radio during his 10 days in space, no special provisions were made on board the spacecraft in terms of equipment - unlike the situation today on the International Space Station. Garriott simply used a hand-held transceiver with its antenna in the window of Spacelab-1. His first pass was down the US West Coast. "[A]s I approached the US, I began to hear stations that were trying to reach me," he told QST. "On my very first CQ, there were plenty of stations responding." His first contact was with Lance Collister, WA1JXN, in Montana. 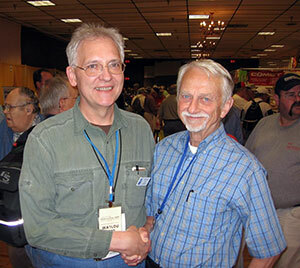 ARISS ARRL Representative Rosalie White, K1STO, met Garriott when he attended Hamvention, "both times, sitting next to him at Hamvention dinner banquets," she recounted. "Once when he was a Special Achievement Award winner, and once with him and [his son] Richard when Richard won the 2009 Special Achievement Award. Owen was unassuming, very smart, kind, and up to date on the latest technology." 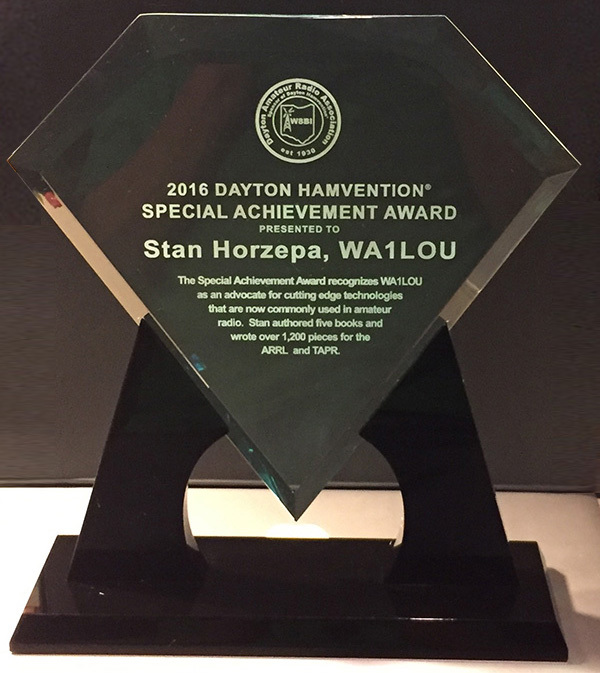 Garriott shared a Hamvention Special Achievement Award in 2002 with fellow Amateur Radio astronaut Tony England, W0ORE. It is with great sadness that the ARISS team recognizes the passing of our great friend and colleague Astronaut Owen Garriott, W5LFL (SK). Owen Garriott died at his home in Huntsville, Alabama on April 15, 2019. A passionate amateur radio operator and ionospheric physics researcher, Owen inspired the amateur radio community to reach for the stars. His multi-decade vision to bring amateur radio with him as part of his journey in space was realized in 1983 on the STS-9 Space Shuttle Columbia mission, where hams the world over for the first time heard a fellow ham call CQ from space. As the first to operate ham radio in space, Owen blazed a trail that has enabled countless people from around the world to experience what it is like to journey into space and explore our universe. As a result, he inspired the international amateur radio community to extend his modest ham station on STS-9 into an international human spaceflight ham radio program that has spanned the Space Shuttle, Mir Space Station, and International Space Station. A member of the U.S. Astronaut Hall of Fame, Owen Garriott was a pioneer and innovator in all his endeavors…including amateur radio. Selected as a NASA scientist-astronaut in 1965, Garriott was the science-pilot for Skylab 3, the second crewed Skylab mission. Skylab was the first U.S. space station, housing 3 different crew expeditions from May 1973-February 1974. Owen spent approximately 60 days on Skylab, doing solar physics research, human physiological research and conducting 3 spacewalks to repair Skylab and extend its research capabilities. Owen’s ham contacts on STS-9 were trailblazing for many reasons. They represented the first ham radio contact from a human in space to someone on Earth. They allowed the general public to directly listen and communicate with an on-orbit crew where, prior to this, only NASA mission control personnel or heads of State (U.S. Presidents, etc.) could talk to astronauts from space. And the mission also demonstrated that a group of volunteers could successfully build a ham radio station for a human spaceflight vehicle and get it formally approved by a space agency. Owen spent decades attempting to carry out ham radio on one of his missions, employing gentle assertiveness and steadfast patience to realize his dream. In 1965, when NASA was considering Owen for a planned lunar flight on Apollo 18, 19 or 20, Project MOONRAY was proposed by the Project OSCAR team. Project MOONRAY would support amateur radio operations from the surface of the moon. This initiative was scuttled when Apollo lunar expeditions ended at Apollo 17. Prior to his flight on Skylab, AMSAT submitted a proposal to NASA called SKYLARC (Skylab Amateur Radio Communications). Unfortunately, this proposal was turned down. But, as they say, the 3rd time was a charm on STS-9 and ham radio is now a human spaceflight reality. Also, it should be noted that an AMSAT/ARISS International team is pursuing Owen’s plans to fly ham radio to the moon via several lunar proposal initiatives, including the Lunar Gateway. Owen inspired legions of amateur radio operators, world-wide, to support human spaceflight amateur radio endeavors and for countless individuals to become ham radio operators. This includes his son, Richard, W5KWQ, who together with Owen became the first multigenerational American ham radio operators to communicate from space. On behalf of the ARISS International Team, we would like to extend our sincere condolences to the Garriott family, including Owen’s son Richard, W5KWQ and Owen’s wife Eve. As Owen has inspired the amateur radio community to reach for the stars may we wish Owen Garriott Godspeed and a wonderful journey amongst the stars. Lately, the batteries in my iPhone and MacBook Pro have been discharging rapidly. The iPhone is over five years old and the MacBook is over six years old, so I figured it was time to replace their original batteries. Amazon sells replacement battery kits for $15 and $50 respectively. Both kits include all the tools required for the task. I viewed how-to videos on YouTube. The only difficult part of the tasks seemed to be removing the old batteries, which were attached to the iPhone and MacBook cases with a two-sided tape-like adhesive. In the past, I've handled worse do-it-yourself computer tasks successfully, so I ordered the batteries from Amazon. The iPhone battery replacement was not too bad. Working with the tiny screws with my 68-year-old eyes was the most difficult part of the task. Removing the two-sided tape was a little tricky. You are supposed to grab the tape at one end of the battery and pull it out from under the battery, but the tape kept ripping in my fingers tips. I finally used a needle nose plier to get a good grip on the tape and pull it out. The job took about 30 minutes from start to finish and was a success. The iPhone is now like new with regard to its battery discharge rate. The MacBook Pro battery replacement was easier than I expected because the glue holding the battery to the computer case had dried out over the past six years and it did not take much prying with a small chisel to free the battery. It took about 45 minutes to do the job and like the iPhone, the MacBook Pro's battery discharge rate is like new now. I would have completed the MacBook battery replacement more quickly except that I had a big surprise when I opened the case: dust all over the interior of the computer including large dustballs, as you can see in the photo above. It took an extra 10 to 15 minutes to remove all the dust before I screwed the cover back on to the MacBook case. I was very pleased with the results. Besides saving money, I also saved time by avoiding a visit to the Apple store. 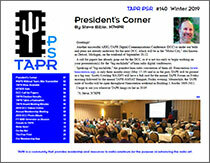 The deadline for the pre-Hamvention issue of TAPR's quarterly newsletter, Packet Status Register (PSR), is here. 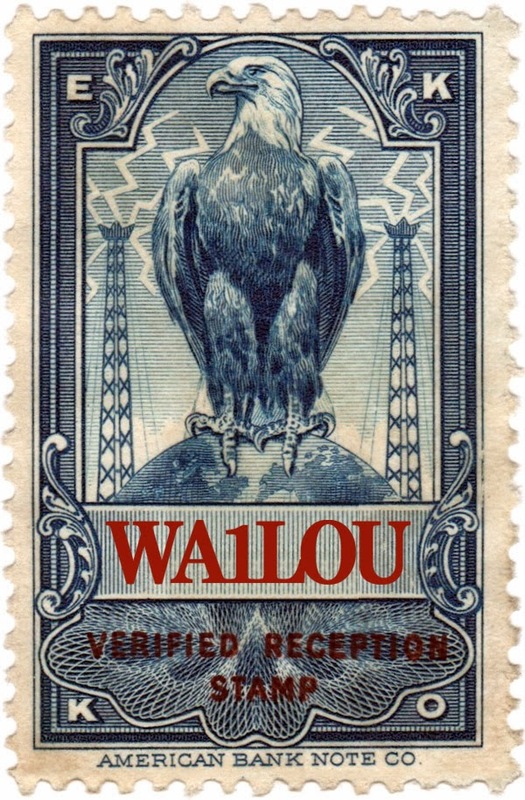 This is the last call to send your cards, letters, articles, etc., whatever you have, to me by clicking on the WA1LOU mailbox in the righthand column of this blog.